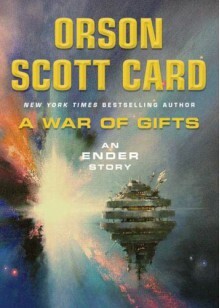 Orson Scott Card offers a Christmas gift to his millions of fans with this short novel set during Ender's first years at the Battle School where it is forbidden to celebrate religious holidays. The children come from many nations, many religions; while they are being trained for war, religious conflict between them is not on the curriculum. But Dink Meeker, one of the older students, doesn't see it that way. He thinks that giving gifts isn't exactly a religious observation, and on Sinterklaas Day he tucks a present into another student's shoe.This small act of rebellion sets off a battle royal between the students and the staff, but some surprising alliances form when Ender comes up against a new student, Zeck Morgan. The War over Santa Claus will force everyone to make a choice.